At Villa Poema de Amor in Sayulita, there are plenty of fabulous accomodations for you to choose from. Our two bedroom options are perfect for a family or small group. Both options can accomodate and sleep up to 4-6 guests. Please note rates displayed are for Casa Neruda. For complete pricing details please select the Pricing tab. If you require less space, please visit our 1 bedroom casas page, including the most romantic honeymoon suite in all of Sayulita! If you have a larger group and need more room, please visit our main Villa Poema de Amor page to rent the entire villa with a total of 5 bedrooms for 10-12 guests. Casa Neruda is a gorgeous 2 bedroom 2 bath second floor unit at Villa Poema de Amor in Sayulita. 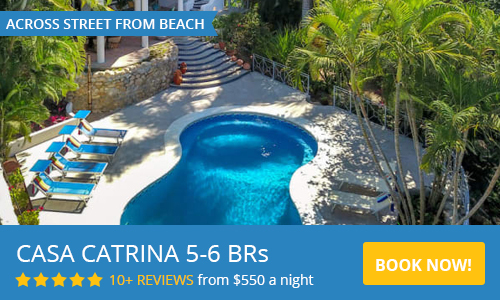 Located on the quiet south side of Sayulita, you will feel as if you have stepped into paradise. Casa Neruda offers luxury and privacy all at once. With breathtaking views of the ocean, sunny, breezy patios, open concept living room and kitchen with plush bedding, you'll never want to leave! The Bedrooms at Casa Neruda include one Master King bedroom with a stunning view of the ocean with private balcony. The master bathroom has a tub/shower combo that overlooks the bay. There is also a second Queen bedroom with a view of the town, pool, and gardens. There is a separate second bathroom with a shower. The living room at Casa Neruda offers a daybed that can sleep one to two extra guests. A beautiful patio opens up to Los Muertos Bay and an expansive view of the ocean. The open floor plan connects to a fully equipped kitchen that offers a stove top and oven, toaster, refrigerator, and coffee maker to enjoy locally ground beans for your morning coffee. Consists of two units, Casa Lorca and Casa Hafiz, that when combined can accomodate and sleep between 2-4 people. Both casitas make up the entire first floor of the villa, and offer a total of 2 bedrooms with a full kitchen and kitchenette. There is a private bath at Casa Lorca and separate bath at Casa Hafiz. The Bedrooms in both units offer comfortable king size beds, with amazing views of the ocean. 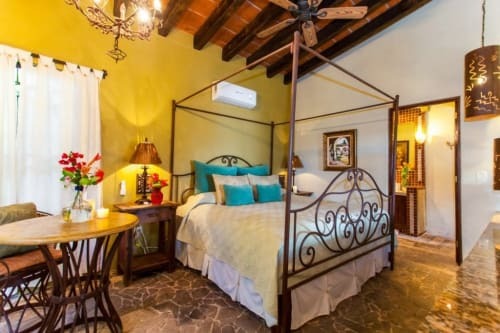 Casa Lorca is a studio - style layout, with the large king size bed directly across from the kitchen and dining area and a separate bathroom. Open patios with comfortable seating and tables overlook the blue, sparkling, Sayulita bay. The living space gets plenty of natural sunlight and amazing views of the sunsets in the evening. At Casa Hafiz, there is a beautiful palapa patio for you to enjoy and take in the cool, ocean breeze. The first floor units are also closest to the swimming pool. Please use the contact form to get in touch with any questions and to request a reservation. We look forward to welcoming you to the casas at Villa Poema de Amor. Beautiful house overlooking the ocean. Great pool, great facilities, great property managers. Quick to fix any issues we were having. Make sure you get good directions to and from the house for any car services—could be difficult for some drivers to find. This is a great spot with a fantastic view. I would stay here again in a heartbeat, we also utilized Jeffrey's setup for the personal chef and it was great! 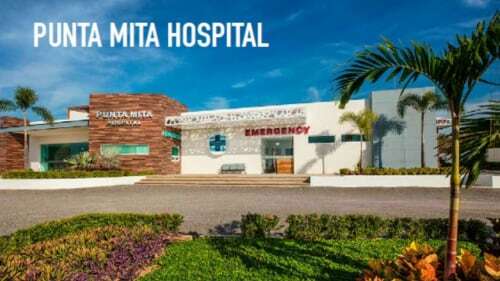 This place was amazing, had a great view, very clean and everything was how it said it would be. We definitely recommend!! Loved Los Muertos Beach nearby. Walked to town every day. We had a great time. The place has a beautiful traditional style with amazing views and the pool is nice. Easy walk to the beach and town. We loved it. We loved our stay at Casa Neruda. Everything was perfect for our family. Our children loved the pool. We hope to visit this home again the next time we are in Sayulita. Seasonal rates are per night and in US Dollars. Please note $25.00 Damage Waiver Insurance covers $1500. worth of damage. You are personally responsible for any damage that exceeds that amount of coverage. If you require less space, please visit our 1 bedroom casas page, including the most romantic honeymoon suite in all of Sayulita! If you have a larger group and need more room, please visit our main Villa Poema de Amor page to rent the entire villa with a total of 5 bedrooms to accommodate 10-12 guests.